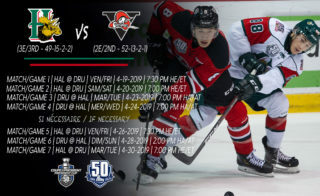 The Scotiabank Center, home arena for the 2019 Memorial Cup presented by KIA, will host its first postseason games of the year this weekend when the Halifax Mooseheads host the Quebec Remparts in their first-round playoff encounter. 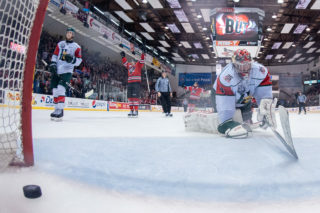 The Mooseheads team begin its playoff journey after completing its most successful regular season in six years, clinching first place in the Eastern Conference on the final day of the regular season with a record of 49-15-2-2 and 102 points, nudging out Baie-Comeau in a tiebreaker. The Remparts finished eighth in the conference with a record of 27-28-7-6 and 67 points. 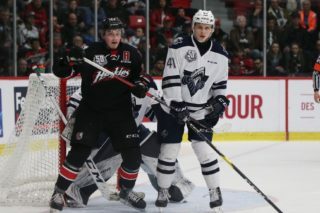 Despite their 35-point differential in the standings, the Remparts swept the two-game season series between the teams. On October 3rd in Quebec, the Remparts’ Aleksei Sergeev and Philipp Kurashev both found the back of the net in their team’s 6-2 victory. On January 5th in Halifax, three different players – Nicholas Savoie, Samuel Dickner and Étienne Verrette – would all score their first goals of the season in a 4-3 come-from-behind victory over the Mooseheads. 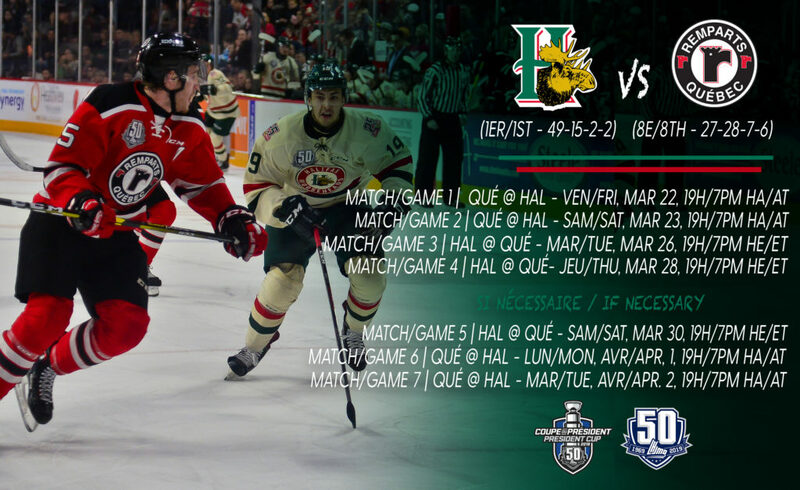 This marks the 21st playoff appearance for the Mooseheads and third straight overall. 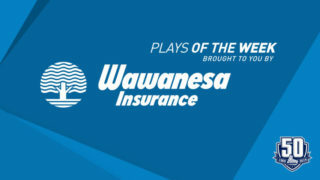 Last season, they defeated the Baie-Comeau Drakkar four games to one in round one, before falling to the Charlottetown Islanders in a four-game sweep during the league Quarter Finals. The club has reached the President Cup Final on three occasions; 2003, 2005 and, most recently, in 2013, when they defeated the Drakkar in five games en route to their first the QMJHL title, then the Memorial Cup. The Remparts have qualified for the postseason every year since the club relocated from Beauport, Quebec prior to the 1997-98 season, an incredible run of 22 straight years. 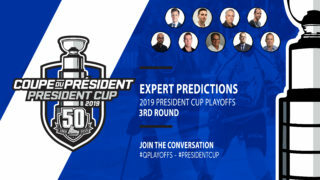 Quebec will be looking to advance beyond round one for the first time since 2015, a year in which they fell in double overtime of Game 7 to the Rimouski Oceanic in the President Cup Final. 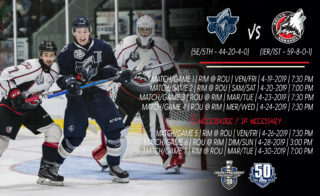 That was the Remparts’ second voyage to the QMJHL championship round, the first trip occurring in 2006 when they fell to the Moncton Wildcats in six games. The Remparts would win the Memorial Cup as QMJHL Runner-Ups over the host Wildcats that same year. Leading the way on offense for Halifax is center Samuel Asselin. Acquired from the Acadie-Bathurst Titan in September, Asselin posted 48 goals and 86 points on the year, both tops on the team. Also leading the charge offensively are center Benoit-Olivier Groulx (80 pts in 65 games), 2019 NHL Draft Top Prospect Raphaël Lavoie (73 pts in 62 games) and Arnaud Durandeau (73 pts in 68 games). Jared McIsaac (63 pts in 53 games) led a defensive corps that contributed on both offence and defence all year. Between the pipes, Alexis Gravel put up career highs in wins (33), GAA (2.49) and save percentage (.913%). The Remparts were led by Swiss standout Philipp Kurashev, who recorded 65 point in 59 games. Other standouts included center Andrew Coxhead and winger Matthew Groucy, with 47 points apiece. The club acquired defenseman Pier-Olivier Lacombe from the Gatineau Olympiques, who would go on to be their top scoring blueliner with 38 points in 66 games. Between the pipes, no less than six players tended the twine for Patrick Roy’s crew this season, including veteran netminder Kyle Jessiman, who was acquired from the Baie-Comeau Drakkar at the trade deadline. These two clubs have only faced off once in the postseason over the years. However, it would prove to be a series for the ages. Trailing 3-0 in their Quarter Final series in 2012, the Mooseheads would go on to force overtime in Game 7 thanks to a four-goal performance from Cameron Critchlow at the Quebec Colisée. Jonathan Drouin’s tally with just over five minutes remaining in the fourth period would bring Halifax all the way from the brink of elimination and propel them to the league Semi-Final. The Mooseheads also face the former incarnation of the Remparts, the Beauport Harfangs, on three consecutive occasions, losing in 1995 and as part of a round robin format in 1996, before experiencing victory in 1997. The Memorial Cup is a recurring theme in this series. While the Mooseheads prepare to host the event this May, the Remparts represent the last QMJHL team to have hosted the event, back in 2015. As previously noted, both clubs boast a CHL championship in their past while both Head Coaches have earned national titles as well. While Patrick Roy’s came with the Remparts’ 2006 victory, Mooseheads’ bench boss Éric Veilleux won it all with the Shawinigan Cataractes in 2012.